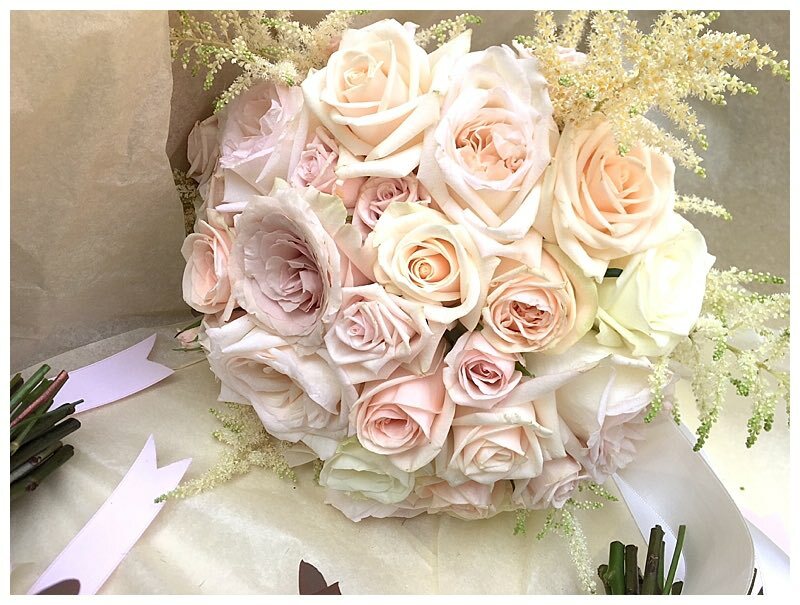 My list of top Surrey wedding flowers that stand out as being that extra bit more special and capture the look of that year’s trends is never easy to pull together. Every year in January, I look back at our florist adventures of the year gone past and try to come up with such a list – it’s tricky so I always end up stretching the list a teeny bit . Over the next few weeks I will look at different favourite type of venues and the weddings we fell in love with at each of them. This week I look at rustic barn wedding flowers. 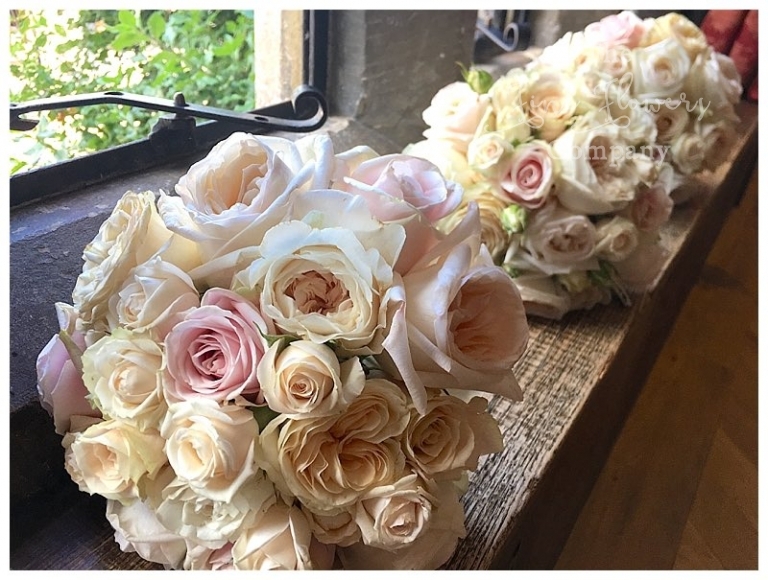 Surrey wedding flowers 2017 – at our favourite Tithe Barn of all – Great Fosters! Great Fosters is a beautiful wedding venue in Surrey, which combines a gorgeous and modern ceremony space – the beautiful and light Orangery, with a charming Tudor-age Tithe Barn – steeped in history, full of beautiful old oak beams, and large enough to host wedding breakfasts for up to 180 guests orevenmng receptions for up to 250. For brave couples, the outdoor garden pavilion adds another dimension as a possible alternative for civil ceremonies. 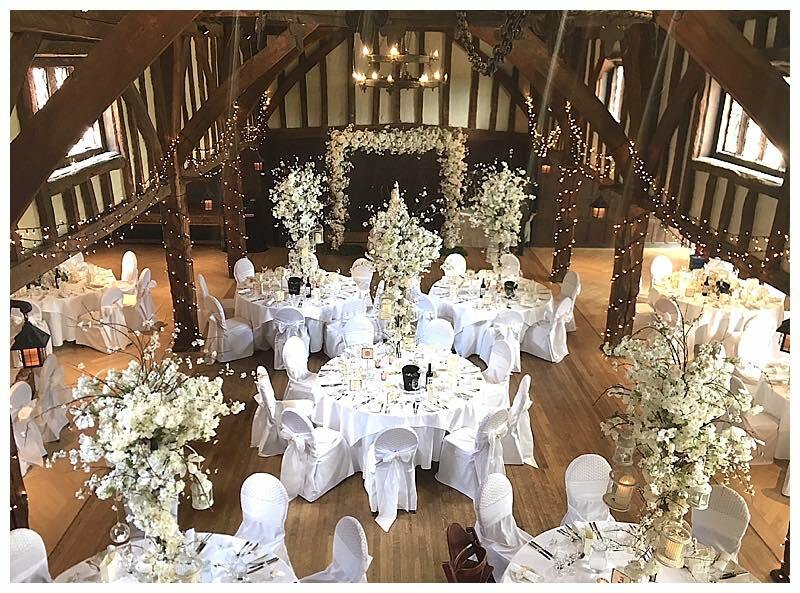 We have been recommended florists at Great Fosters for just over 10 years now, and I never cease to be amazed how versatile this venue is. Not only is it surprisingly big but more importantly, it retains a cosy and intimate feeling while comfortably accommodating quite large weddings. At the other end of the spectrum, if you plan on having a more typical number of guests of 90 – 100, the style of the rooms makes that number look equally at home, rather than looking like you have a lot of empty space. But the most fantastic thing about it, is how easily it takes on so many different personas, being able to carry off a whole range of style of weddings and wedding flowers, be it rustic and informal, be it dreamy or lavish, or classically elegant, or whimsical and quirky. With quite a few wedding flowers adventures at this local Surrey venue, very close to our base, it was quite hard to pick just a few, as there are so many lovely weddings and wedding flowers styles to choose from. 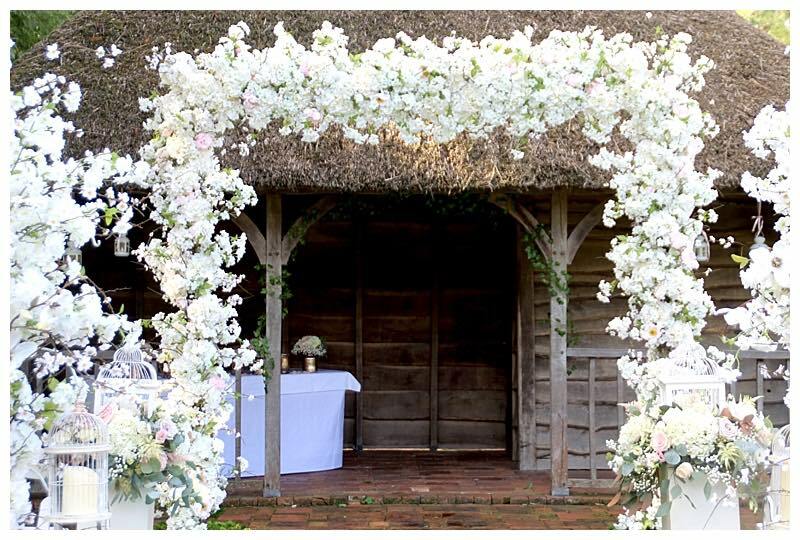 But here are my favourites Surrey barn wedding flowers at Great Fosters last year, a fantastic year in bloom! Lauretta and Jonah, both ballet dancers, stole the show for me with their beautiful outdoor wedding at Great Fosters. They braved the somewhat breezy August day and held their ceremony outside, in front of the rustic outdoor pavilion. 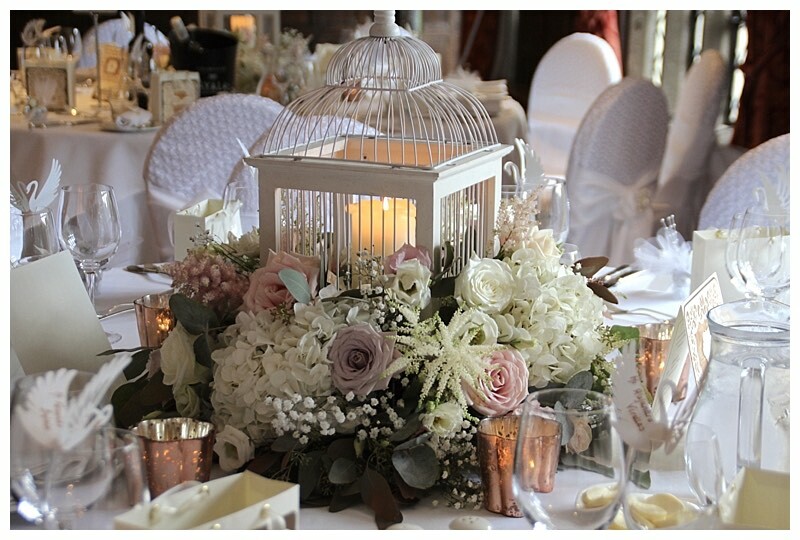 We lined the wedding aisle with our romantic wedding flowers blossom trees and bird cage floral lanterns on plinths, to create an amazingly dreamy wedding aisle. 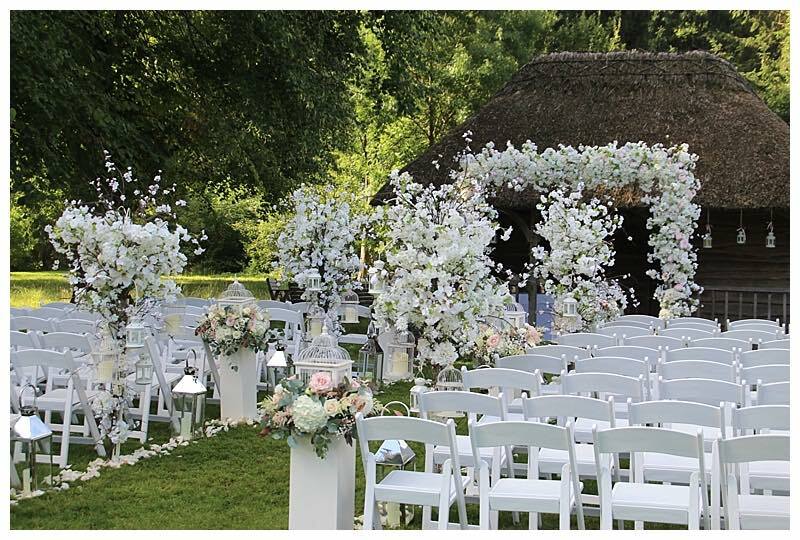 To top it all, our matching floral arch created a stunning focal centrepiece for the ceremony itself. All the amazing aisle flowers and arch, were then magically moved safely inside, to dress the beautiful Tithe Barn for the wedding breakfast. 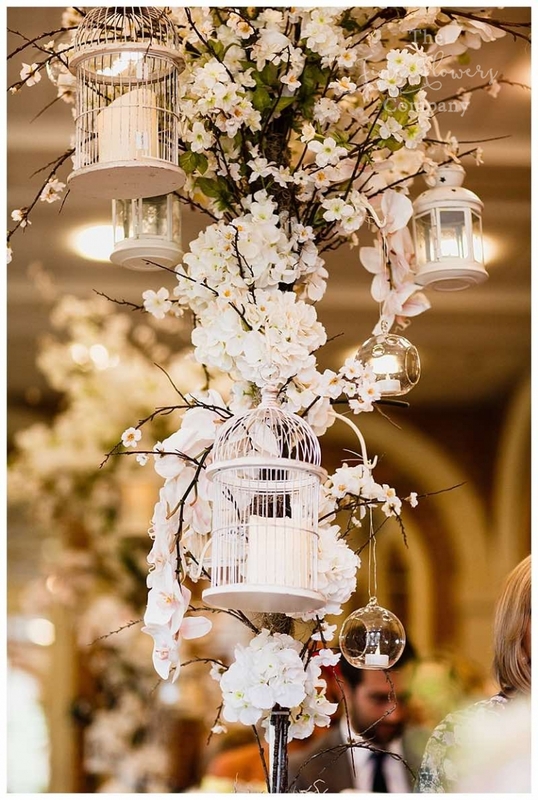 The flower trees looked amazing on the central tables under the high peak ceiling of the barn, while the low floral bird cage lantern centrepieces were used on the tables under the eaves of the barn. 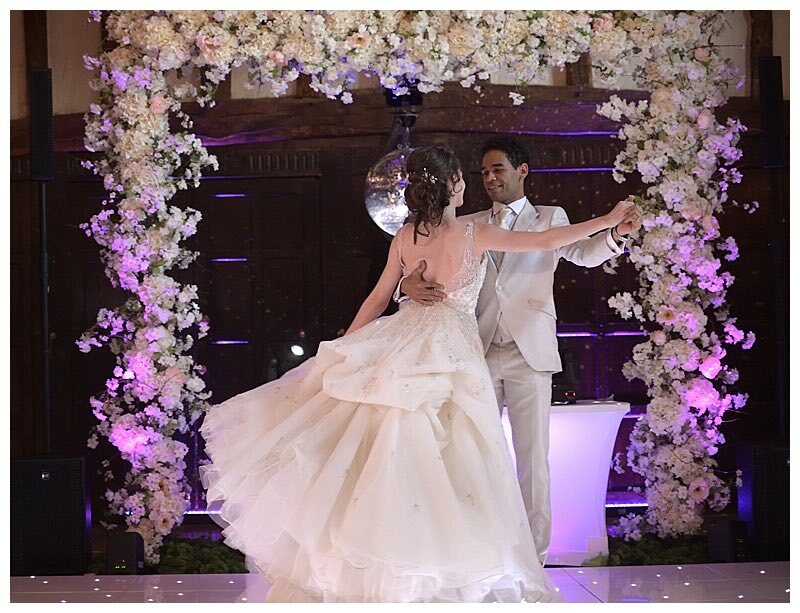 The floral arch created a magical backdrop to Lauretta and Jonah’s first dance, and the cutting of the cake. The shot of them swooning past the arch looks just amazing! 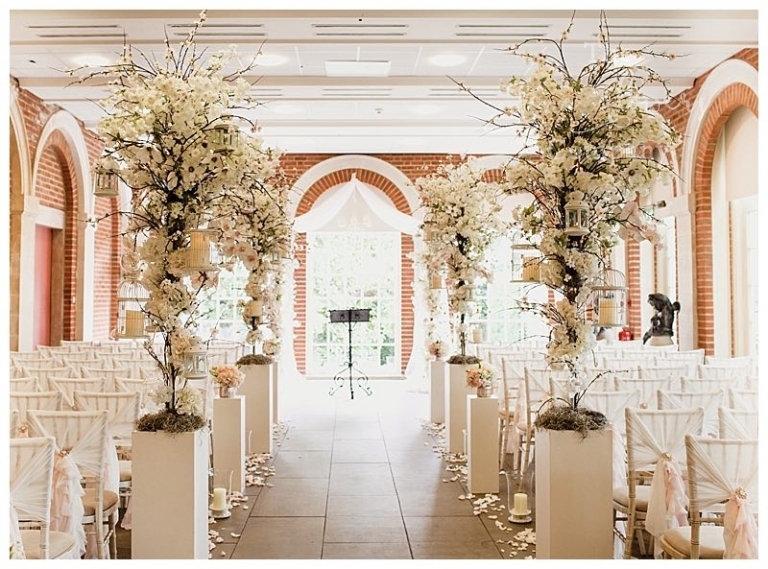 Laura and Michael opted for an indoor wedding ceremony in the Orangery at Great Fosters. 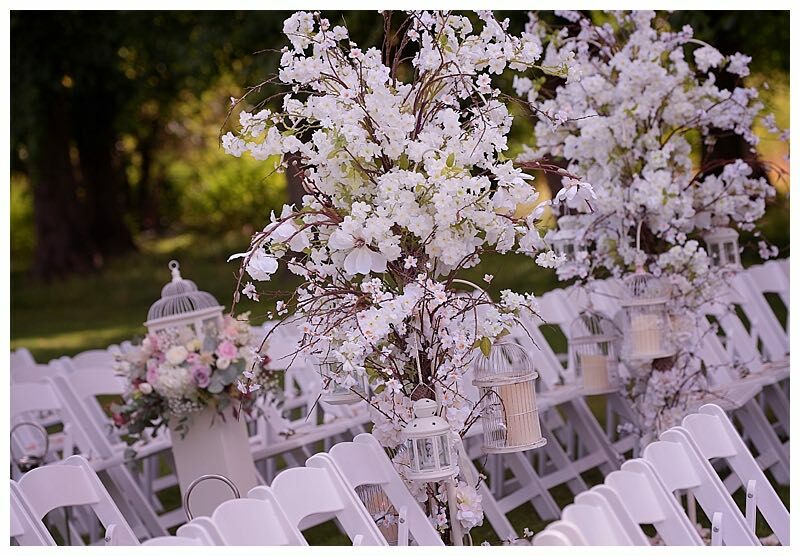 Our blossom flower trees came into their own again down the aisle, creating a magical space, while for the ceremony, we created an ethereal part-arch part-canopy structure to showcase the wedding ceremony. For the wedding breakfast, Laura and Michael wanted the barn to look quite different and opted for more polished and luxurious table centrepieces, bursting with gorgeous ivory and blush summer blooms. Tall centrepieces draping with pearls strands dressed the tables in the high part of the barn, while romantic candle-lit clusters of low vases and candles with pearl details, dressed the tables under the eaves of the barn. Far from the selection of jam jars and bunting that can dress the barn at the barn at the other end of the style spectrum, this lavish take on barn wedding flowers looked perfectly at home again and soooooo pretty! In contrast with the first two weddings above this one was all about forest greens rather than lots of pale blush blooms, wild and unstructured, again whimsical but much more rustic. Jade and Dan’s brief was to create a magical woodland wonderland, with unstructured designs, lots of logs and foliage, and lovely deep rich colours. 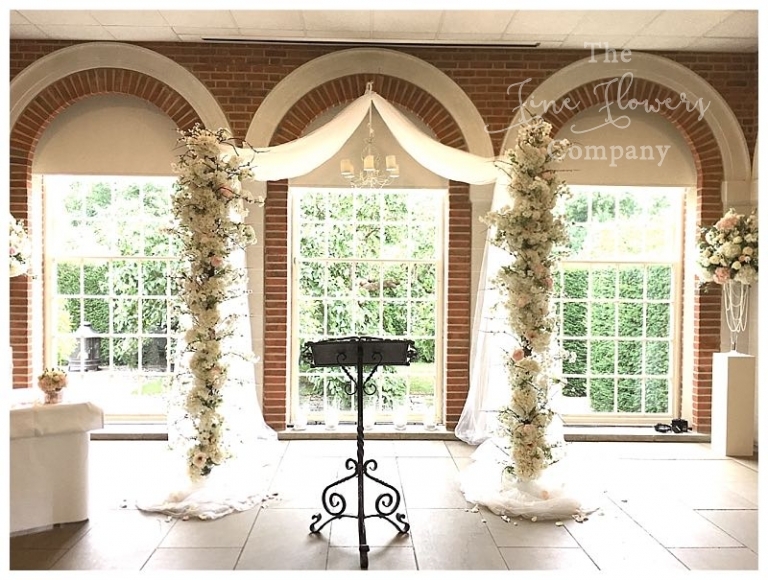 The wedding ceremony was again held in the Orangery at Great Fosters. The Orangery was transformed with a long wedding aisle of foliage displays dotted with logs and candles. Framing Jade and Dan during the ceremony, was a rustic arch with deep purple and lilac hydrangeas and wild dusty pinks and lilac flowers. The space high up was dressed lightly with long lengths of ivy crossing over the Orangery width overhead, and hanging globe tea light holders dotted around. Later on the freestanding arch and the foliage displays were pushed against the orangery wall to create a floral photo-booth backdrop later on in the evening. For the wedding reception in the Tithe Barn, Jade and Dan opted for really large all-foliage displays with hanging gone tea lights, as the main centrepieces. Around the base of these displays we placed small vintage bottles with sprigs of flowers, and moss. For the side tables under the eaves of the barn, we created low centrepieces overflowing with flowers, all following the rustic and laid back theme. Some of the tables used vintage wood crates filled with floral displays, while others used a cluster of small jars, vases and vintage bottles with flower posies in them, dotted amongst stacked wooden logs and candles, and moss. The top table was dressed with a long rustic log section dotted with pretty bouquets in vases, and a wild hanging displays of flowers dressed the minstrel gallery over the top table. For more Surrey wedding flowers ideas, please visit our gallery pages which are bursting with inspiration of all things floral. 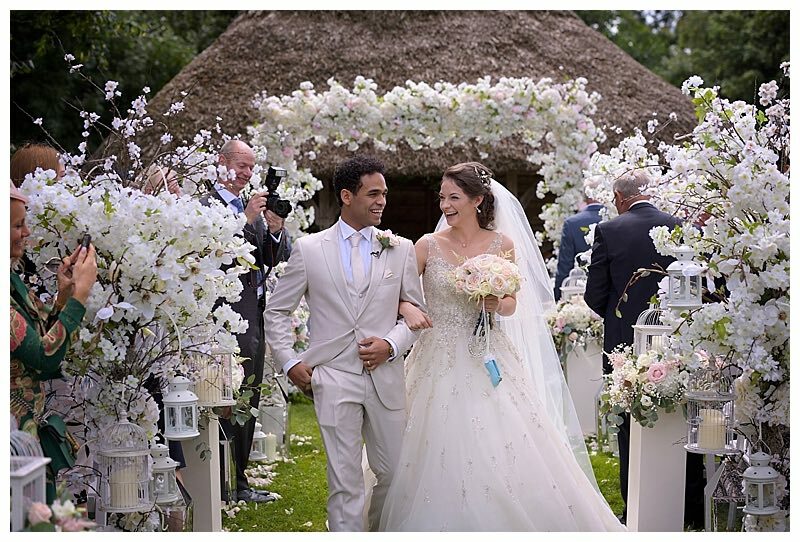 Or if you are planning your wedding at Great Fosters, please check out the extensive Great Fosters wedding flowers pages with lots of beautiful featured Great Fosters weddings.